She’s been an inspiration to me, and one of the reasons I’ve always grown up assuming that science and medicine isn’t that unusual a field for women to work in. Now I know that things are a lot more complicated, but as I child it seemed perfectly normal to see her as often in the lab as in her living room, hosting family get-togethers. Ruth Guttman is a professor emeritus of behavioral genetics in psychology, at the Hebrew University in Jerusalem. She was born in Austria in 1923, to a Polish Jewish family (the Halperns) that had fled Poland on the eve of WWI. In the very early 1930s, her family was uprooted again, leaving a successful grocery business in Austria for refuge in the United States. Eventually arriving in New York, Ruth learned English, finished high school, and worked as a waitress and possibly maid as she attended local college classes. As a Zionist, she was interested in emigrating to Palestine to help form a new Jewish state, but believed the young country would need residents who could bring a more scientific understanding of agriculture. In the early 1940s, she applied to Cornell’s School of Agriculture but was rejected since the school did not accept women. According to family lore, Ruth wrote to First Lady Eleanor Roosevelt, who may have interceded on her behalf, since when Ruth re-applied, she was accepted. At Cornell, Ruth’s interests moved from agriculture to the blossoming field of genetics. She also met Louis Guttman, a young professor in the sociology department. Born in New York and raised in Minnesota, where he earned a doctorate in social and psychological measurement, Louis was also a passionate Zionist interested in moving to Palestine. In 1946 or 1947 they married, and soon after sailed to Israel, on the eve of its independence. In 1952, Ruth completed her PhD in psychology at the Hebrew University in Jerusalem, and began researching how genetics affects behavior, particularly in the areas of cognitive traits and personality development (including as they relate to school performance). By studying identical twins, she explored how some behaviors may be due to genetics, and others to environmental factors. Her later research, on mice, addressed questions of the influence of genes on aggressive behavior and addiction. In addition to her long career as a professor at Hebrew U, Ruth also took short-term positions while on sabbatical (frequently in the US) and shared with colleagues in other departments the idea that genetics can play a strong role in many human behaviors. She was also a driving force behind efforts to quantify and apply sophisticated statistical methods to psychological research. In this, she and her husband, Louis, were strong partners; he was a professor of sociology at the Hebrew University, and developed scale and factor analysis, multidimensional scaling, and facet theory. In addition to her teaching positions, Ruth was also Director of the Scheinfeld Center for Human Genetics in the Social Sciences at the Hebrew University and a Senior Research Scientist at the Louis Guttman Institute for Applied Social Research, Jerusalem, Israel. Ruth and Louis had three children, whom they raised in Jerusalem as Israel fought several wars. The university was on the other side of a city frequently under siege, and I remember hearing about how how Ruth – a young mother – would board the armored military convey to take her to the campus, under threat of shelling or gunfire. Ruth and Louis loved to travel, when possible, and would send letters and photos to their children (and later grandchildren) from Australia, China, and California. 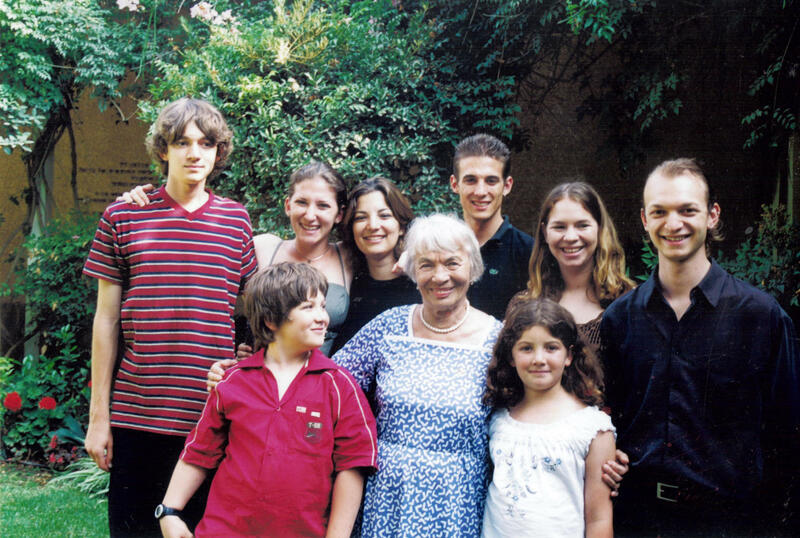 Today, Ruth has 8 grandchildren, living in the US and Israel. Louis passed away in 1987. Ruth is retired and lives in Jerusalem with her youngest daughter and her family. On her 80th birthday, Ruth’s entire family and several decades of colleagues and graduate students gathered to celebrate and convey how much her work and mentorship had influenced them. Personally, I feel that beyond her legacy as a grandmother who taught all us children the proper way to eat a formal meal and write thank-you notes, she has also been an inspiring role model as a woman in science and academia. This entry was posted in Biology, Psychology. Bookmark the permalink. I am one of the descendants of the Herskovits’ in Transylvania. I have reasons to believe we are related to Mrs.Ruth Guttman. I would like to contact you. There are too many coincidences.